The Antos Antler is a completely natural bone from Scottish highland deer. They have simply been cleaned, made safe and cut to a size that dogs can chew on. These long lasting chews are full of calcium and minerals and, while they encourage your dog to chew, they help to clean and strengthen their teeth. As they are unprocessed they will not splinter and make no mess as your dog enjoys chewing it. Please note: Antos Antlers are sold according to weight not size so you may get one which comes in a different shape to the picture. 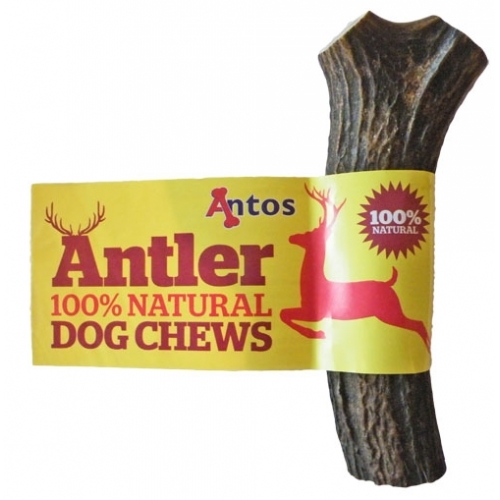 Below are some recent questions we've received regarding Antos Antler Natural Dog Chew, including answers from our team. Would this be suitable for my 11 month old puppy?